Although setting up an online store may not be a big deal, driving traffic and getting customers to convert is a definite challenge for eCommerce store owners. Driving heavy traffic to your site doesn’t mean your conversions will be high. The first quarter of 2016 saw an alarming spike of 75% in shopping cart abandonment. It’s clear that eCommerce store owners are losing out on a lot of money and customers because their website needs more rework in terms of optimization and other external facilities that will make customers want to buy. Since Conversion Rate Optimization (CRO) isn’t something new to the eCommerce industry and there are hundreds of CRO techniques that you may have tried, it’s highly possible to overlook certain elements. In this blog, we’ll discuss such elements that you must consider as part of your CRO strategy. Our CRO techniques are highly successful and yield the desired results for our clients. This is because we regard our client suggestions highly and get constant feedback about our work. That’s when we discovered some easily overlooked elements that can enhance user experience and make them comfortable in making a purchase on your website. Yes, you heard it right! Focusing on your font may feel insignificant. Your website could have some of the best products with excellent content and even a nice font. But if they are not readable enough, visitors simply exit your website. Your website will be visited by different kinds of people who fall under various age groups and poor fonts/typography can cause a communication gap with your customers, forcing them to leave. Your font size, style and design can impact your customer’s perception about your website. If this wasn’t really important, tech giants like IBM and Google wouldn’t invest on subjects like eye-tracking and scroll-measuring systems. ClickLaboratory conducted a typography test which decreased their bounce rate and exit rate by 10% and 19% respectively. Not just that, they had a whopping conversion rate increase of 133%. If you’ve been ignoring your Call To Action (CTA) buttons, then it’s high time you start focusing on them. Your CTAs are the gateway for your customers to take the desired action and enhance engagement. It’s important to not just blindly place the CTA button without understanding its impact on your users. Size, text, color and placement are the most important CTA elements that you must consider. This is because these elements have the ability to convince and influence customers. Fonts and CTAs are easy to overlook website elements that have powerful impact on your conversions. A font or CTA placement might look good in design, but hurt conversions. This is exactly why CRO can be quite tricky and smaller changes might surprise you with good results. 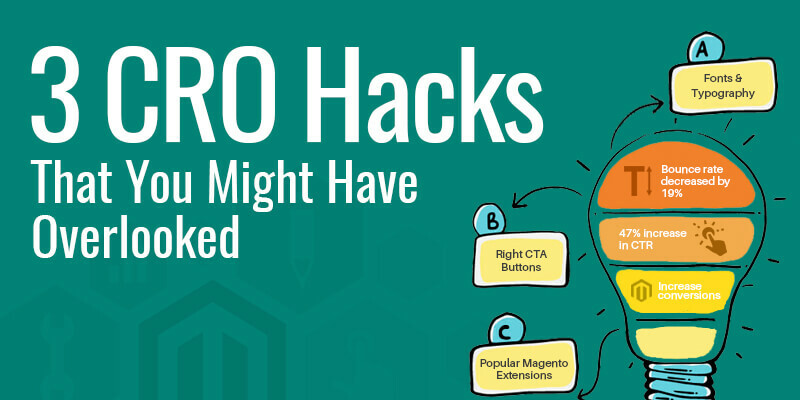 Another recurring trend we see is that eCommerce store owners forget to use extensions for CRO. Magento is one of the most popular eCommerce platforms with extensive extensions that will create more user friendly pages and thereby increase conversions, but developers use extensions mostly for site features and theming. Over the years, our customers have found that even a 1% increase in conversion rate could double their revenue. As the above ideas illustrate, you could be losing out on easy fixes and modules to convince your visitors to buy and convert. Optimizing your online store can be an unending process. But with a consistent strategy and thorough A/B tests, you discover more areas where chances of conversions can be quite high. If you’re still doubtful about your hidden conversion possibilities, talk to our Magento CRO experts and find out how you can increase your conversions.